One of the notable characteristics distinguishing Zentangle® from the multitude of imitators now flooding the market is its guiding principle of gratitude and appreciation. A Zentangle session is a Ceremony beginning with a pause for reflection focused on gratitude and appreciation for everything in our lives. This gratitude extends right down to the tools we have the privilege of creating with, including the beautiful custom artists’ paper of our Zentangle tiles and the exquisite marks we make with deliberation and our Sakura Micron pen. And, without doubt, for the artists who generously share their lovely tangles with us and through which we are able to express our creativity. Today our special gratitude and appreciation goes to Maria Thomas, Zentangle co-founder, who celebrates her birthday tomorrow (Saturday, August 15th) and without whom we would not have our shared joy of Zentangle. If you are familiar with Maria’s “story”, you will recall that as an artist from the youngest age Maria had a frequent dream where she had invented a new color. We now know that color to be Zentangle. A few summers ago in honor of Maria’s birthday co-founder Rick Roberts created the Zentangle-original Assunta tangle which we feature here today in our Buried Treasure. Every time we pick up our Micron pen and enjoy the texture and beauty that is a Zentangle tile, gratitude and appreciation go into our process. Appreciation and love that flows both ways — from us to Rick and Maria, and from them to all of us who share their magical journey. In love and gratitude, Happy Birthday, Maria! How to switch back and forth easily between the Mobile and Desktop versions of TanglePatterns.com on your mobile device. Linda’s List of Zentangle-original tangles — THE tangles to learn first if you’re new to the Zentangle Method. 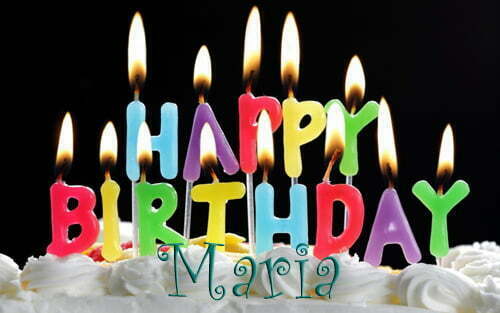 Have a wonderful birthday Maria! Happy Happy Birthday to you Maria!……… plus may I add my wishes to all the tanglers who have been having Birthdays recently; the rest of us really DO appreciate your sharing your skills and ideas with us. So what that amounts to, is “Happy Birthday (whenever it is!) to all of us ! !”…….but with an extra special ‘virtual’ hug to you Maria! So glad it is your Birthday Maria. Zentangle has given me so much pleasure. Happy Day Maria! I hope you had a fantastic birthday & it only gets better with each passing day. Did you know that all calories that you consume on your birthday don’t count at all? Just a FYI for the next one! Thank you so very much for sharing your Zentangle knowledge so freely to those of us who are just having fun doing some of them, & feeling a bit more confident about drawing. What a great win-win situation!